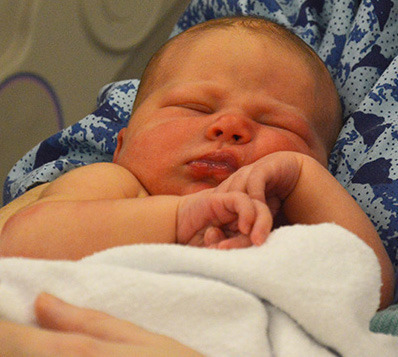 Mackenzie Bingham was born bright and early on New Year’s Day. Brandon Bingham and Meghan Salidas welcomed their second child Mackenzie Bingham at 7:25 a.m. on New Year's Day. Mackenzie Bingham was born at 7:25 a.m. on New Year’s Day. Not due for almost another week, she was determined to be West Coast General Hospital’s first baby of the year. She entered the world at 6 pounds, 11 ounces. “She wasn’t due until Jan. 6,” said her mom Meghan Salidas. This is her and Brandon Bingham’s second child. Their first is Miles, 19 months. The baby came so fast that her dad Brandon Bingham almost missed her. The couple, who live in Ucluelet, were staying at Bingham’s cousin’s house here in Port Alberni. When Bingham heard that Salidas was going into labour, he rushed to the hospital. When he asked where Salidas was, he was told she wasn’t there yet. “I asked where Meghan was and they said they didn’t have a Meghan,” he said. Bingham started to drive back to the house and passed an ambulance. “I just thought oh that must be her,” he said. He rushed back to the hospital and got there just in the nick of time.